We have all heard that Artificial Intelligence (AI), Robotics and Machine Learning will change the way we do business, utilise staff and run our organisations. But what does this really mean to you and your business and what should you be considering now as these developments start to impact on us all in many different ways. Presentation from guest speaker Rohan Toll of the AI Academy. Rohan will demystify our understanding of Artificial Intelligence (AI), Robotics and Machine Learning, explaining what it is, what it isn’t and why this will be the biggest disrupter of business norms for the next decade. Opportunities for you to discuss one on one with local business owners already embracing and using AI. Networking opportunities with local business owners and managers. This event will help develop the already vibrant and dynamic digital entrepreneur eco system in Noosa. WHERE: Noosa Boardroom Function Room, Noosa Civic Commercial, 28 Eenie Creek Rd Noosaville. TICKETS: $15.00 inc GST – Limited numbers. CATERING: Finger food and drinks included. In order to thrive in the era of AI we don’t all need to be data scientists. But we do need to gain a better understanding of how this technology will affect us as business owners and managers. This is the mission of the AI Academy and Rohan Toll. As a professional speaker, Rohan has helped multitudes of people over Australia come to grips with rapid technological change. By creating AI readiness programs and presenting at community events, Rohan and the AI Academy have helped many business owners maximise the potential of their people and staff to produce extraordinary outcomes in the age of technology. 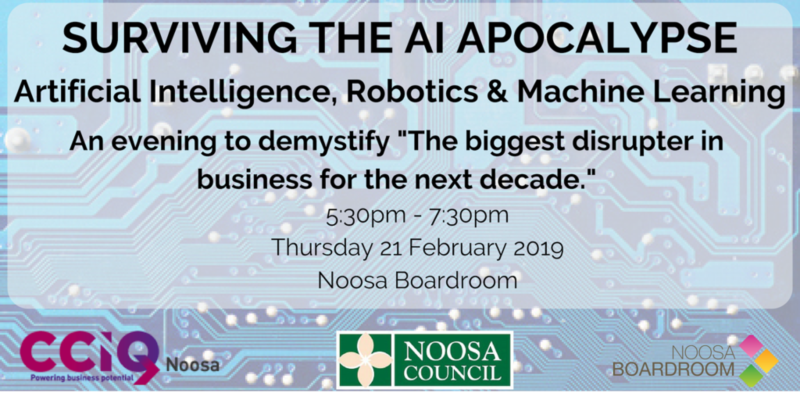 Join us in connecting ideas, resources, skills and advise to help Noosa grow on the innovation map. Brought to you by event partners CCIQ Noosa, Noosa Council and Noosa Boardroom. A big thank you to Noosa Council Economic Development unit for their support of this event and encouraging local entrepreneurs to have a go!